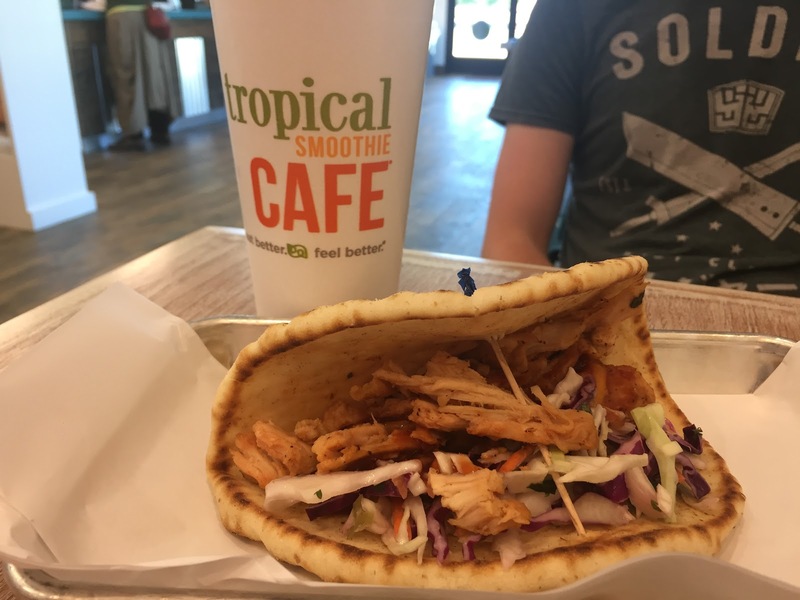 In the morning, we had originally planned on checking out Kennedy Groves, which was a small park close to the Airbnb we had stayed at; however, after waking up rather later than planned, we ended up driving to Tropical Smoothie Cafe in Pinole. 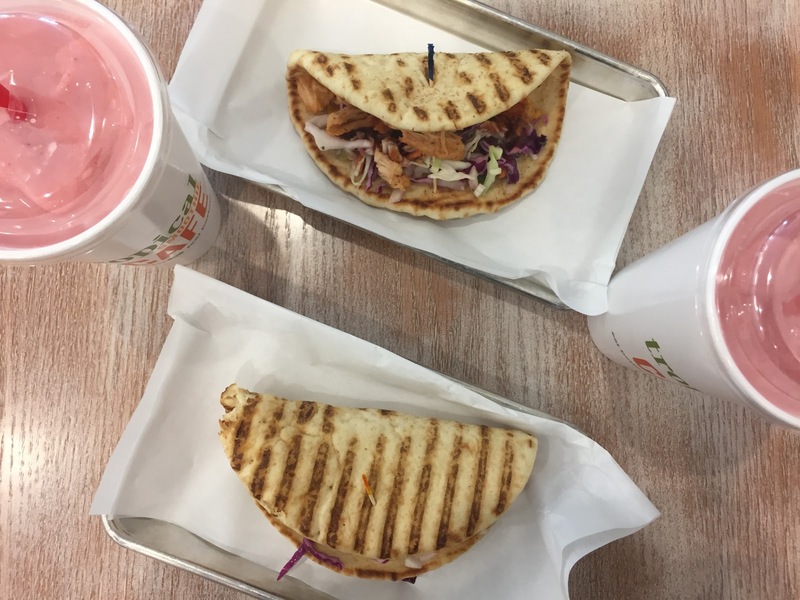 Chris and I both got the Hawaiian BBQ Flatbread with the Bahama Mama (strawberry, pineapple, white chocolate & coconut – major yum!). Their food was really good and the prices were very affordable. I’m so bummed there isn’t a closer branch to me back home. Before leaving for Hamilton, Chris and I stopped by Sushi Go for an early dinner. We originally planned on dining closer to the theatre, but the parking pass we bought wasn’t available until an hour before the show. With that, we chose to eat local instead. We found Sushi Go through Yelp. Their menu is a lot smaller than most sushi places, but mostly because it’s theme is sushi-on-the-go. After dinner, we made our way to the Orpheum Theatre for the show. If you saw my previous post, you would already know that Chris proposed before the show! The show was AMAZING. Words can’t even describe how ecstatic we were to finally see it live after almost two years of waiting. If you like the theatre, Hamilton is a must-watch!!! The Bahama Mama sounds delicious! Even though there isn't a Tropical Smoothie Cafe in SoCal, at least there are other good places ;). You can never go wrong with sushi!!! I like how you gave Chris tickets to the show and he gave you a ring at the show. Glad you had a great first day! The Bahama Mama does sound really good! 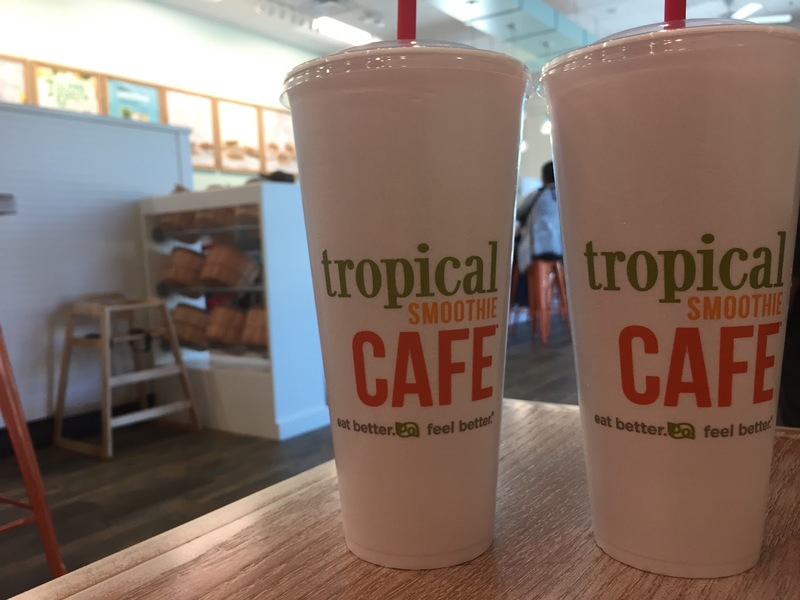 There's a Tropical Smoothie Cafe near me, but I've never been! After reading this, I'll have to give it a try. Congratulations on the engagement, that is wonderful news! 😀 I am sure it made the show amazing. Oh I LIVE for sushi! What a lovely time! I like your maroon shoes! Congrats on the engagement!!! It sounds like it was an amazing day! Sounds like a wonderful day. Congrats again! Still haven't seen Hamilton. It's not coming to Las Vegas until the end of May 2018. Love the picture of you two lovebirds! Wow, sounds like an AMAZING day. I'm still catching up on your posts after my trip to new yrok and clicked on this first – AND LITERALLY TRYING NOT TO FANGIRL right now about Chris' proposal. CONGRATULATIONS <3 I'm so happy for you both! I just checked and there's actually one in Rancho Cucamonga – if you wanna make that drive xD Gift exchanging, basically?? You should definitely give it a try! They're not too expensive either. Thanks, Kya! It helped make the show more enjoyable! Thanks Kim. I got it at Forever 21 last winter. Thanks, Valerie! It was a great day, indeed! Thanks again. 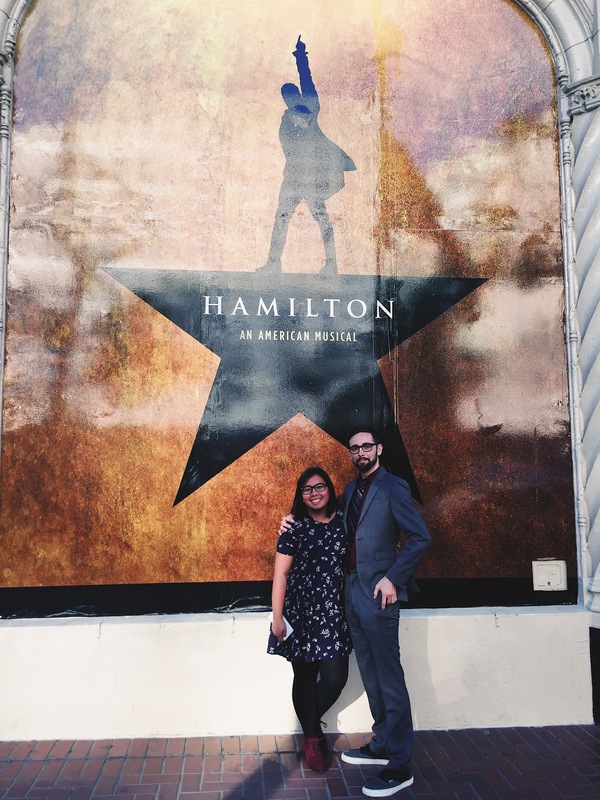 You should definitely see Hamilton – it was soooo good. I'll have to look at tickets so we can drive over and watch it again. Hehehe thanks Pauline! You're too sweet! I'm so jealous that you got to see Hamilton!! !